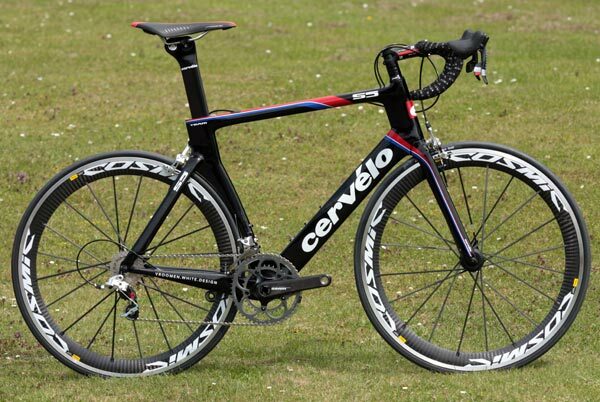 This is the next generation of aero road bike from Cervélo. 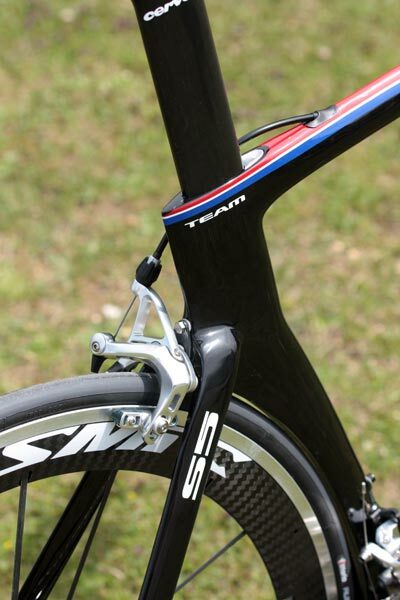 Named the S5, Cervélo has jumped over the O4 version so it takes up where the S3 left off. 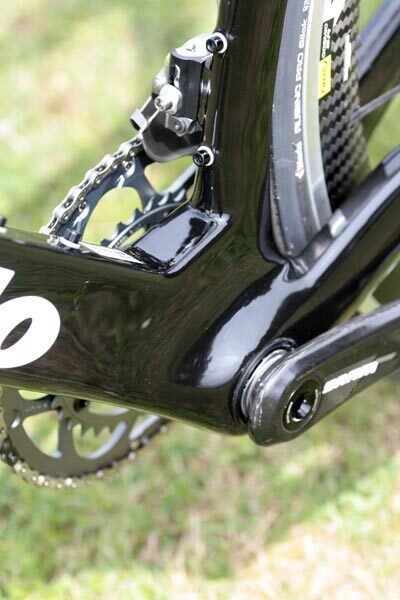 Regular Cervélo admirers will already understand the design language the Canadian frame manufacturer has used, as it borrows much from the P4 time trial machine. The most obvious lift is the seat tube, its close fitting and a proper ‘cutout’ but still uses a vertical drop out for easy wheel changes. At both ends of the seat tube the frame also mimics the P4 with a dual head seat post and whopping bottom bracket. The headtube has also seen a lot of work with the downtube junction effectively being dropped down to the crown – check out the limited space between the tyre and the downtube, Cervélo says that it’ll still run a 25c but our guessing is it’ll be a close-run thing. The down tube has also been altered so that the lower half is a truncated aerofoil or Kam tail to reduce drag around the bottle. Two bottle mounting points also feature on the down tube, the lower pair of holes of the three for a single bottle and the upper pair if you plan to run a second bottle on the seat tube. Even the seat stays have been looked at and the joint between them and the seat tube shows a real attention to detail – it’s very sleek. Three frame models will be available in the UK; the S5 VWD £3999.99, S5 Team £2999.99, and a vanilla S5 for which the price has yet to be set. The version you see here is one of ten limited edition bikes that has been delivered to key UK Cervélo dealers who’ll be displaying it during the Tour. This limited edition Team model will then be for sale; it’ll weigh in at six grand.